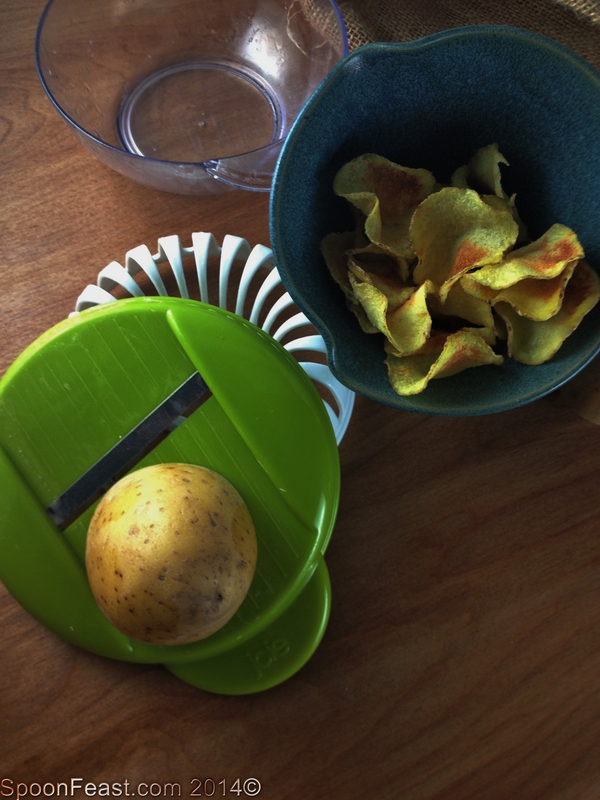 The Potato Chip Contraption is a nifty thing I picked up this past weekend. It’s amazing though how easy it is to “forget” that when it comes to potato chips. So our chip bin has been a bit sparse since I began to process all of our own foods. I’ve been thinking about deep-frying and not being very attracted to using all that fat at home, especially for potato chips. Because, you do know that you’d just have to make fries too, since the oil is hot and the potatoes are out. And you want to make the most efficient use of all resources. It is also highly possible that some chicken wings may have to follow. It just makes sense. Right? I wandered out of the house last week, just to get out for a while. I found myself in a kitchen store, imagine that. When I saw this handy thing, I thought “Well, Hello Chips!” It was less than $10 so it came home with me. Seasonings of choice: salt, pepper, garlic, onion etc. Take a potato; wash it. Peel it, if you want. I like the peel and it carries nutrients too. I recommend just a good scrub. Hold the potato with the hand guard if you want, I don’t use it, but if you’re not sure, use it. The blade is really sharp. 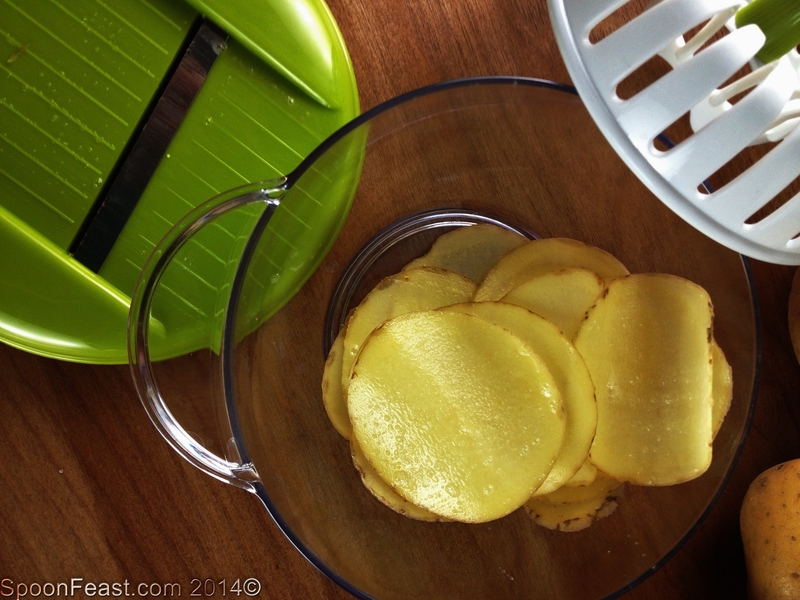 Slice the potatoes into thin slices. I find it works best to make small round slices rather than long oval ones. Why? They fit better on the contraption. Drop the potatoes into a separate bowl, drizzle with a few drops of oil, then season. 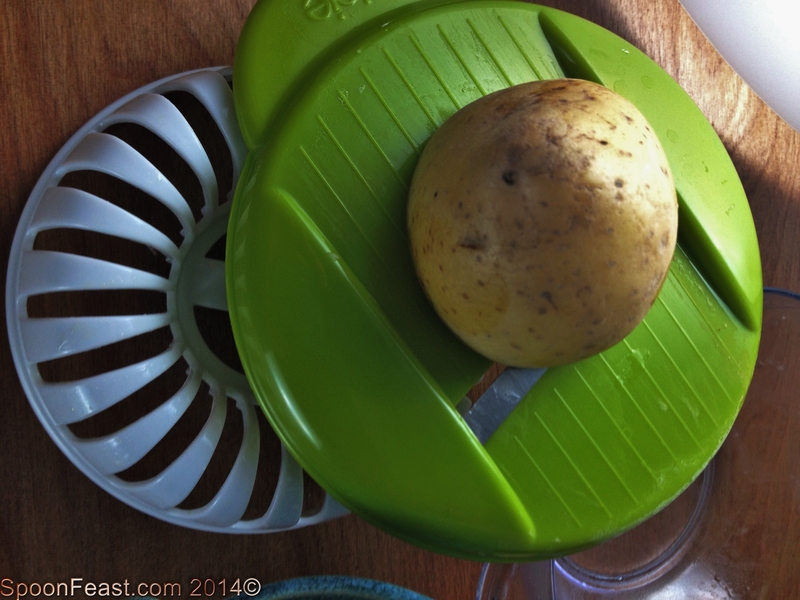 Place each potato slice into a slot on the chip rack; filling up the rack. This will use about 1/2 of a potato which is a perfect one portion size. It takes 24 slices to fill the rack. Place the rack in the microwave and cook the potatoes for 3-4 minutes. Timing will vary. These took 4 minutes, but other batches took less time. Check them, if you see potatoes turning brown, get them out as they are done! Turn the chips out into a bowl and serve. Be careful because they will be hot at first. Remove them from the rack while still warm because if you let them cool, they become very crisp and break when you try to remove them. So work fast! I love to eat good chips and not support processed food manufacturing. We eat fresh chips, not old ones. We get to eat chips without a lot of added fat and we control the salt and seasonings. Ever read the ingredients on the “Salt & Black Pepper” flavored chips? . . . just saying. . . 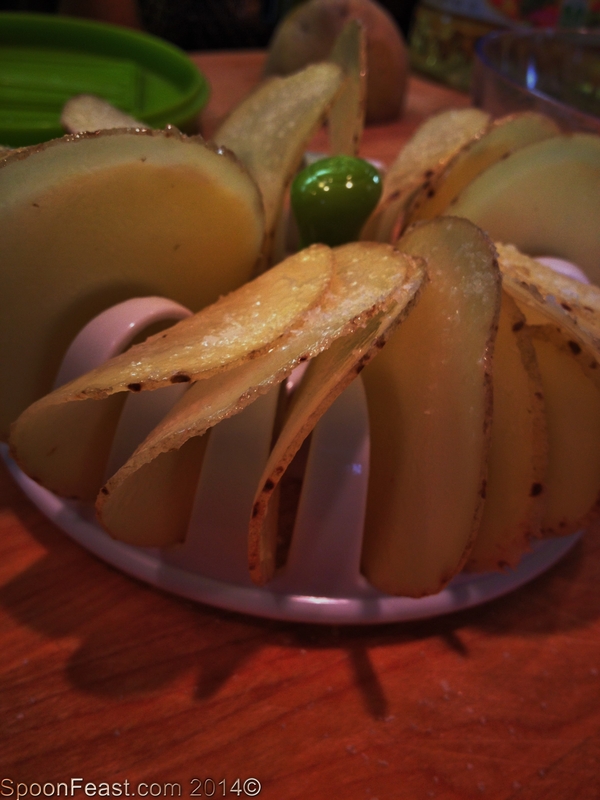 This entry was posted in Recipes and tagged Potato chip, Potato Chip Contraption, potato chips, Potatoes. Bookmark the permalink. Yes, they get nice and crispy! But can go from lovely to burned quickly. 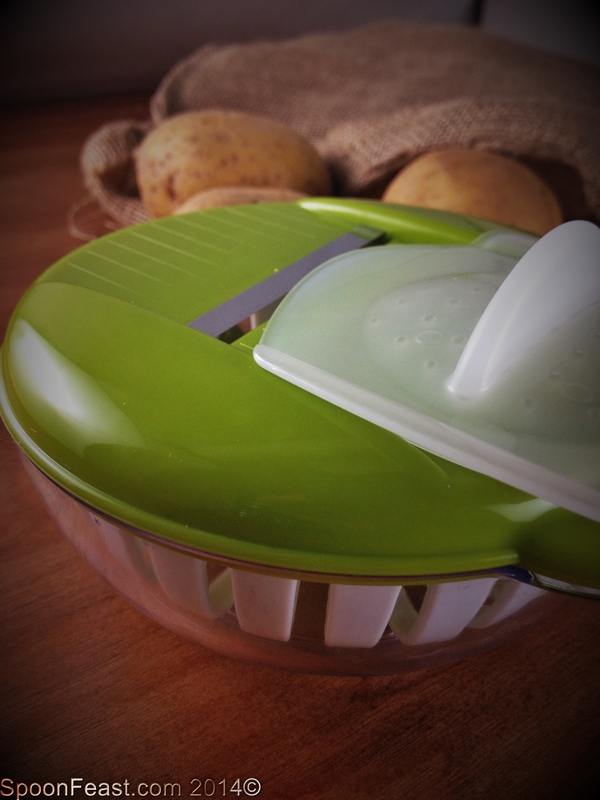 I bought something similar, but had to use my mandoline, and proceeded to slice my finger off. But I’m glad some body is making these!!! 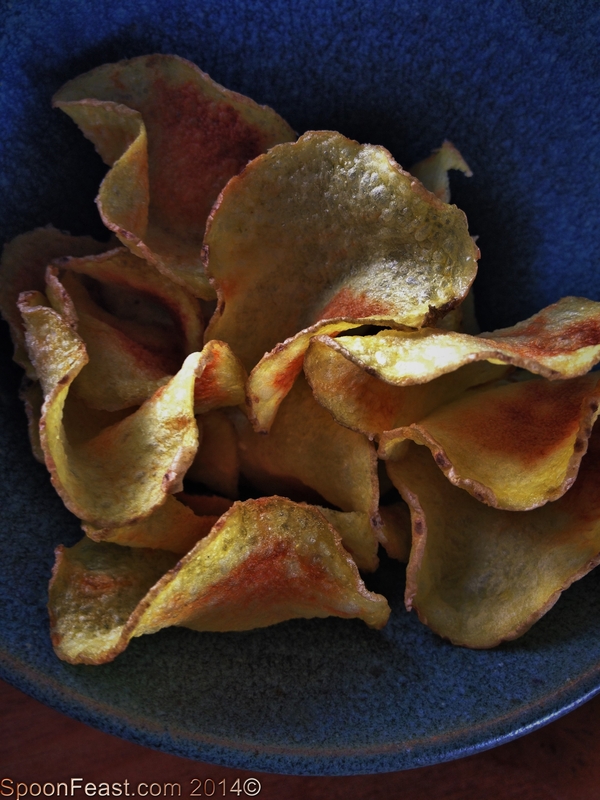 Perfect for crunchy and delicious chips! Genius contraption! 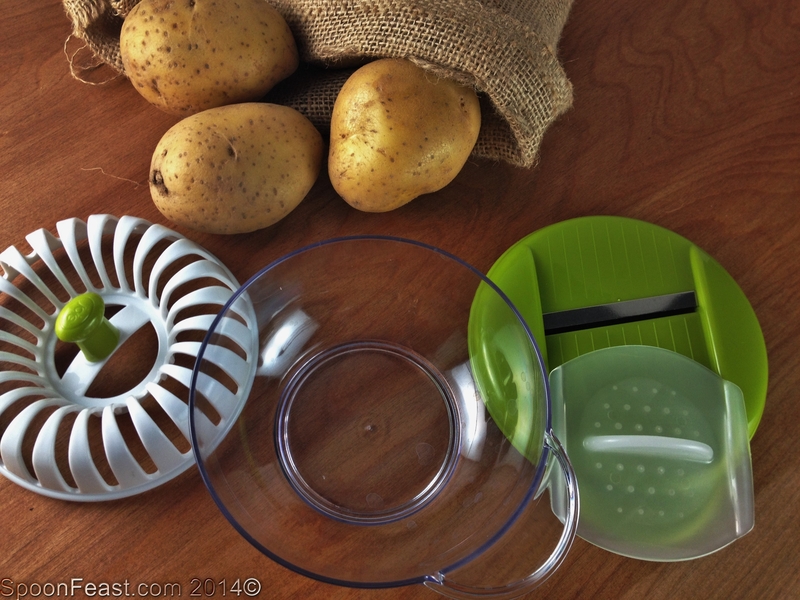 We’ve been doing something similar with a potato peeler and a paper covered plate, but this is so much more efficient! What a clever little tool. Never knew a microwave potato chip maker existed. How many can you make in one go? It makes about 24 chips at a time. I’m using sweet potato and plantain next.